So how is the week going on? Well I am here to share something really sweet with all of you! Its a review on Sweet Treat Cosmetics. I was sent this by the owner of the company herself for review & I must say she is a sweet lady.She packed this surprise for me and I loved it absolutely. Here at Sweet Treat Cosmetics, we specialize in mineral make up and yummy flavored lipglosses to make you look your best! Everything we ‘bake up’ here is named after your favorite delicious treats! A smooth, glittery lip gloss infused with lanolin and chocolate flavoring. This lip gloss will leave your lips feeling silky, but not sticky–and add a subtle hint of color, shimmer and a beautiful shine to your lips. This product is VEGAN and GLUTEN FREE! 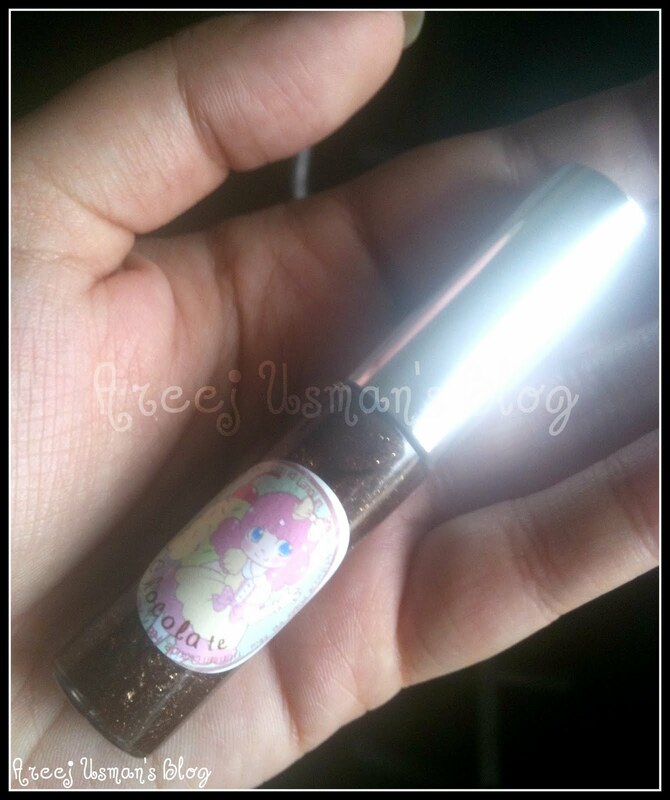 This is such a gorgeous & heavenly smelling treat for the lips just like chocolate itself.Its a chocolate brown shade with glitter in it.When I apply it on the lips it feels like I have applied a coating of melted chocolate on my lips.It tastes a bit like chocolate as well.The size of the gloss is neither too big nor too small.Its quite reasonably sized at 5.9ml tube and priced at $5. Doesnt it look just like melted chocolate! Icing Eye shadow : A beautiful, softy rosy pink with tons of shimmer and dark pink glitter. This color is not vegan and is lip safe. Blue Raspberry Eye shadow: A deep, crisp blue packed with shimmer. This color is vegan, and is not lip safe! Licorice Eye shadow: A smooth, charcoal black with holographic glitter. This color is vegan and is lip safe. Blueberry Tart Eye shadow : A softer, true blue packed with shimmer. This color is vegan, and is not lip safe. Chocolate Mousse Eye shadow: A rich, deep chocolate brown with caramel undertones and gold glitter! This color is vegan and is lip safe. 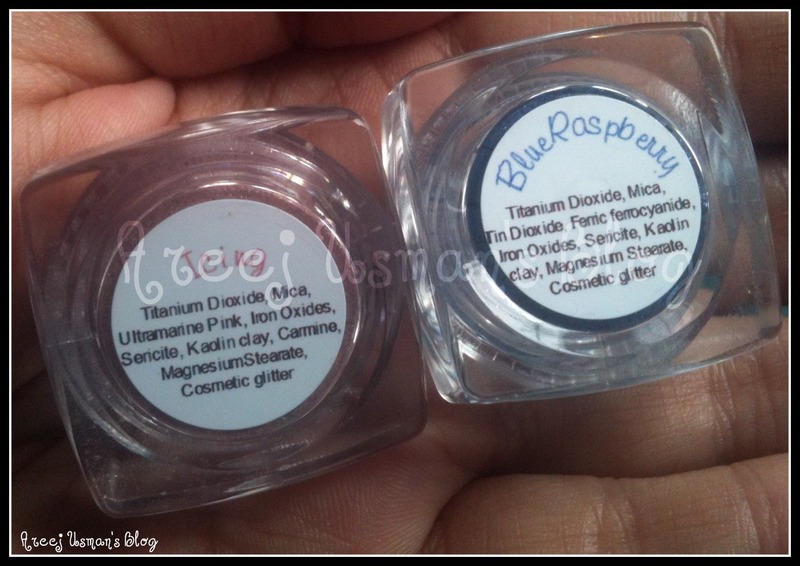 The eye shadows that I recieved in 5gm jars are Icing & Blue Raspberry.Icing is a soft girly pink shade with loads of shimmer & Blue Raspberry is Navy Blue shade with hint of glitter.The packaging of these 5gm jars is really cute.They are for $5 each.The name for the shade and ingredients are present in detail on the back of these jars. 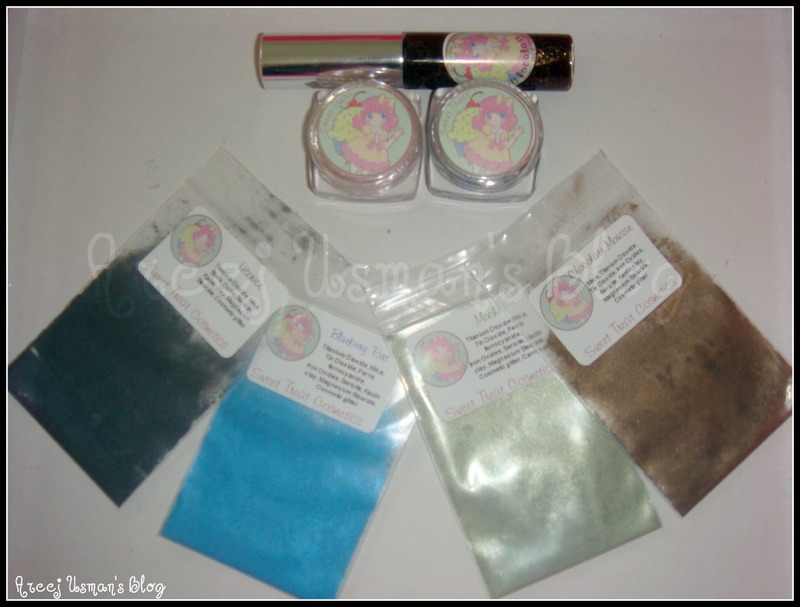 The eye shadows that I recieved in sample bags are Licorice,Blue Berry Tart,Mochi & Chocolate Mousse.The Licorice is a charcoal black with glitter.Blueberry Tart is a lovely bright blue with shimmer.Mochi is a pistachio greenish shade with loads of glitter & Chocolate Mousse is chocolate shade with golden sparkles.These sample bags are for $1 each and they contain quite a sufficient amount for $1 .Out of these colors Icing & Mochi are the most sparkly.My favorite among these is Chocolate Mousse because of the richness of the color.The name & ingredients are at the front of each sample bag. 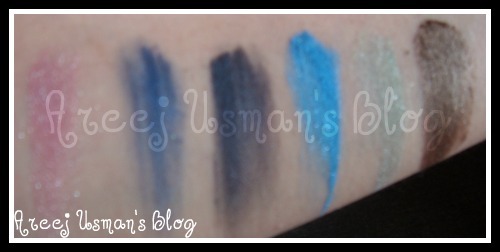 Overall all of them are very richly pigmented,smooth and soft to apply & full of different kinds of sparkles.As I always say they would do even better with a good eye shadow base.In these swatches I havent used an eye shadow base & still the pay off of the colors is so good & I must add they are all single swatched. From L to R:Icing,Blue Raspberry,Licorice,Blueberry tart,Mochi,Chocolate Mousse. I would recommend you to go get these little sweet treats for yourself & u ll definitely love them.Oh yes another important thing is that there is a weekly Flavor of the month where the original price of a chosen product is cut down into half & that special product is 50% off all week.Isnt that great! 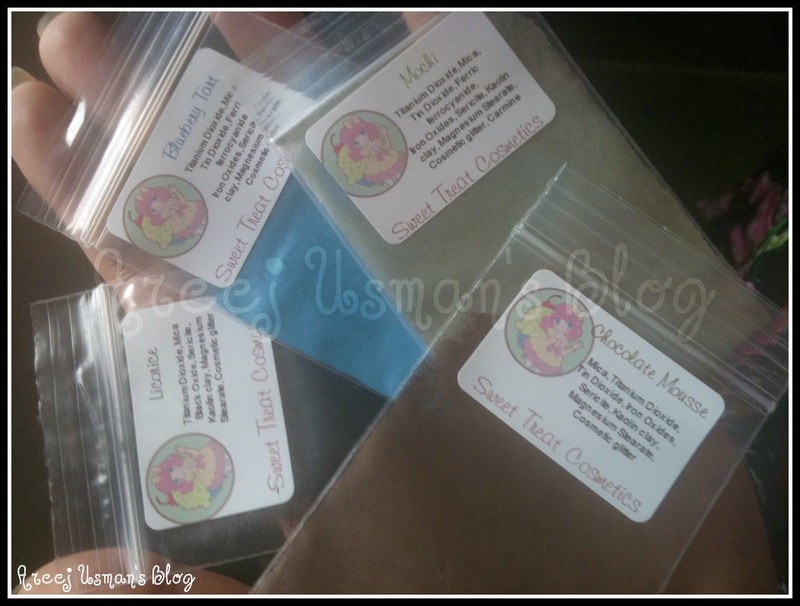 You can reach Sweet Treat Cosmetics here & on Facebook here.The good thing is they ship worldwide. Any comments & queries are welcomed. this company looks soo adorable!! i really wanna try out the products.. Thanks for sharing. Will def check out the link. nice collection. If you want to buy or purchase bulk cosmetic products, then you need to register in india business directory. very nice and pretty collection.